I am a palaeontologist living and working in Alice Springs, in the red centre of Australia. I moved here with my wife and three kids from Johannesburg, South Africa. I used to focus my research on dinosaurs, and it is fair to say I am still a dino nut but these days I work on fossils from the NT, be they turtles, tassie tigers or anything else. In my spare time I like to watch birds, catch beetles, lizards and snakes and generally find out as much about the species around me as I can. 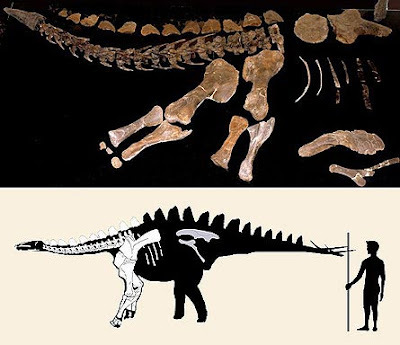 Photo (Octavio Mateus) and reconstruction (from the paper) of the new stegosaur Miragaia longicollum. Once again I'm late to the party. Miragaia longicollum is the newly published, long-necked sauropod mimicing stegosaur from the Late Jurassic of Portugal that was featured in loads of blogs yesterday. Attendees of the SVP annual meeting may have actually caught the reconstruction of Miragaia way back in 2007, in Austin. Even though it was only up on screen for a short time, the crazy long neck was immediately obvious, and I've been waiting for it to be published ever since. Ayway neck elongation in this stegosaur was covered very well by Matt Wedel here. So I won't spend anymore words on it here. Instead I'll delve into the systematics of Miragaia. At the outset let me say that I think the authors have done a great job in this paper and they are thoroughly deserve the publicity they are getting. However this one lttle niggly aspect of the paper has not convinced me and I want to raise the issue here because the fault seems to lie with the whole culture of publication in palaeontology, rather than with these specific authors. First off Miragaia shares a bunch of characters with the roughly co-eval English stegosaur, Dacenturus. These include fusion of the cervical vertebra to their respective centra, dorsal vertebral centra that are wider than long and olecranon process of the ulna developed into a horn-like prong (you can see this last feature clearly in the photo above). Indeed when the two are included in a cladistic analysis the two form a well supported clade which the Mateus et al. call the Dacenturinae. Another interesting tidbit is that the new data from Miragaia shifts Dacenturus from its usual basal position amongst stegosaurids to a derived position next to Stegosaurus itself. Interestingly though when Mateus showcased this skeleton in 2007 he had identified it AS Dacenturus. So what makes Miragaia distinct? Obviously its unusually high number of neck vertebrae is a wierd feature (and there are several others listed in the diagnosis) but this cannot be determined in Dacenturus because it is mostly known from the backend of the animal while Miragaia is largely known from the front. Indeed due to this non-overlapping parts problem just about all of the autapomorphies of Miragaia are not determinable in Dacenturus. So is there a justification for erecting a new taxon? I went through the character taxon matrix in the supplemental material in order to find out if there was any observable differenceand found a few points of difference. All but one f these concerned the continuously variable characters (e.g. ratio of distal width of the humerus to its length)and in most cases the difference was slight so that in more traditional discrete character state coding these features might be given the same state. The one discrete character difference in the matrix concerned the robustness of the dorsal plates but once again the known plates of Miragaia are from the front of the animal while those known from Dacenturus come from further back so we may not be compareing the same thing. In all there seems justification for at most a new species of Dacenturus (especially since its sister taxon Stegosaurus, houses three species which display more disparity than these two genera). Maybe I'm missing something but f so the authors really could have made the distinction between these two genera clearer. Does erecting a new taxon make publishing a new fossil easier? It shouldn't, the Miragaia fossils are fantastic enough to deserve publication in the Proceedings. But nonetheless I have heard talk that editors of these high-impact broad science journals are less keen to publish palaeontology if it doesn't involve a new taxon. If this is so, and I hope it isn't, then it is a practice that has to stop, an important fossil that throws new light on evolution or palaeobiology deserves recognition wether or not it represents a new taxon. (especially since its sister taxon Stegosaurus, houses three species which display more disparity than these two genera). Fine, but it's not like the ICZN mandated consistency or anything. "fusion of the cervical vertebra to their respective centra"
Oops, I meant fusion of the cervical RIBS to their respective centra. "In all there seems justification for at most a new species of Dacenturus"
You are absolutely correct of course, there is no difference in a strict phylogenetic sense. I was drifting lazily into the realm of subjective classification. If we are to treat genera as clades then Miragaia is obviously redundant. Not that I mind redundancy when it comes to genera. We may find a new species that is the sister of another but differs in a substantially large number of characters, indicating quite a large number of missing taxa fell between them. A new genus would be redundant at the time the new species was named but a new one would probably be coined anyway, if some of these missing taxa were subsequently discovered. In this case however the differences are so slight that a case can be made that there is no new taxon at all - we simply won't know how significant the slight differences are until such time as we have a decent sample. Thus I am reserved about erecting a new genus level taxon (these do carry with them certain expectations of distinctiveness and disparity - with very subjective and nebulous values, granted). The problem is lessened of course if we swap to uninomial names, but we are stuck with the baggage of binomial names and the desire to treat genera as clades. "(especially since its sister taxon Stegosaurus, houses three species which display more disparity than these two genera)." True, but that doesn't mean that its a good idea to ignore it completely. Who told you you have to treat genera as clades? I hope you punched them in the back of the neck. Sounds like a wierd genetic engineered dinosaur-mutant from an equally wierd Science-fiction movie, lol. I'm intrigued. It begs the question "What has evolution wrought?" As regards the question of genera vs species, I would err on the side of species of established genera where evident, than new genera, simply because there is little distinction on a phylogenetic tree. However, at the opposite side of this issue is where a genus means more than a species, even if the positioning is the same, largely because of the notoriety and distinction that derives from having named a genus, rather than a species of an otherwise well-known species (which is already somewhat of an historic basket of species). Given that both genera and species are frankly arbitrary when dealing with fossil organisms, I think it's better to make new genera, if only because they are uninomials -- so the mere name doesn't commit you to a phylogenetic hypothesis.